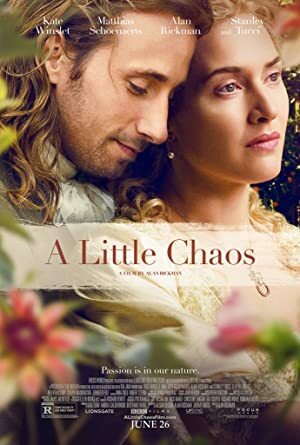 A Little Chaos (2014) – What's New on Netflix Canada Today! The year is 1682. Sabine De Barra (Ms. Winslet), a strong-willed and talented landscape designer, fulfils her chosen vocation in the gardens and countryside of France. One day, an unexpected invitation comes: Sabine is in the running for an assignment at the court of King Louis XIV (Mr. Rickman). Upon meeting with her, the King’s renowned landscape artist André Le Notre (Matthias Schoenaerts) is initially disturbed by Sabine’s distinctive eye and forward-thinking nature, but eventually chooses Sabine to build one of the main gardens at The Sun King’s new Palace of Versailles. Under pressure of time and as she charts her own course, Le Notre comes to recognize the value of a little chaos in Sabine’s process.